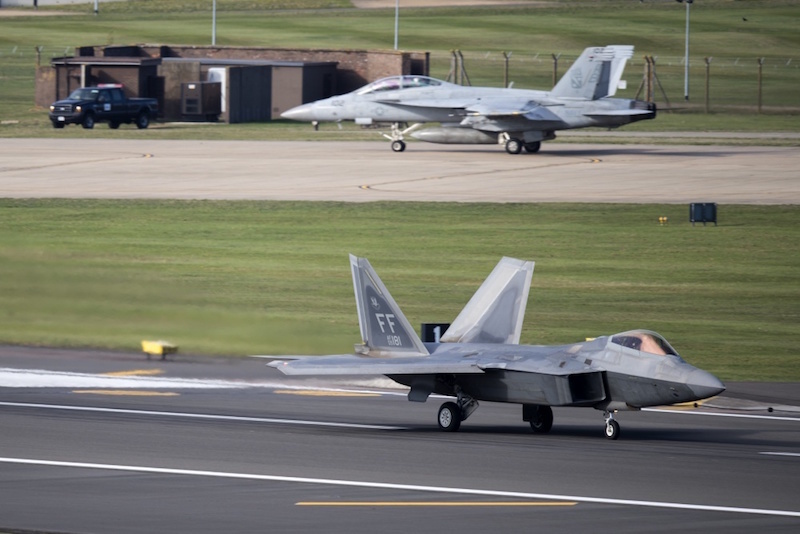 BRANDON, UK --- The Liberty Wing completed a series of large-force exercises with fifth generation aircraft and joint service partners at Royal Air Force Lakenheath, England. F-22 Raptors assigned to the 1st Fighter Wing, Joint Base Langley-Eustis, Va., and F/A-18 Super Hornets assigned to Carrier Air Wing One, deployed from the Nimitz-class aircraft carrier USS Harry S. Truman (CVN 75), participated in this dissimilar air combat training. DACT exercises bring different types of fighter aircraft from various units together for air combat training in the same air space. It was conducted to enhance the professional relationships and improve overall coordination with allies and partner militaries, and demonstrates the U.S. commitment to providing fifth-generation fighter presence in Europe. Participating aircraft included F-22 Raptors, F/A-18 Super Hornets, 48th Fighter Wing F-15C Eagles, F-15E Strike Eagles, 100th Air Refueling Wing KC-135 Stratotankers and a NATO E-3 Sentry. The training integrated fourth generation and fifth generation fighters, as well as fostered cross-service relationship building. Complete control of the skies allows uncontested operation of joint and coalition air, ground and naval forces. Exercises like these demonstrate the U.S. and NATO’s ability to deter threats, assure allies and demonstrate the ability to employ combat air forces in a timely manner.